Books about Inuit Dogs as well as novels with Inuit dogs or sometimes just dogs. The Inuit Dog of the Polar North is the third revised and expanded edition of The Canadian Inuit Dog: Canada's Heritage, with a Forward by Paul Schurke, renown explorer and dogsledding outfitter, from Wintergreen Dog Sled Lodge (Ely, MN). There have been many technological developments that enabled scientists and researchers to pinpoint the origins of the Inuit dog. Advances in DNA analysis have definitely determined who’s who in the dog world. Geneviève Montcombroux has gathered all available information and distilled it in the most readable manner in The Inuit Dog of the Polar North. The book emphasizes the role of the Inuit dog in the life and survival of the inhabitants of the polar regions. It includes detailed chapters on the history of the Inuit dog, its development, character and use in expeditions to recipes for home prepared dog food. The work contains an extensive bibliography. It is still the only book devoted to this unique indigenous dog and forms a valuable resource for anyone who owns or simply loves this amazing dog, which faced extinction in the 1970s after surviving several millennia in one of the harshest climates on earth. Besides much additional material about the Inuit dog, the book also contain many hitherto unpublished photographs. Antarctica: "...to a lonely land I know." recounts a young man's experience during the Golden Age of Antarctic exploration immediately following the end of WWII. Ken Pawson details life in the remote bases where he and his colleagues conducted surveys, explorations and gathered scientific data. 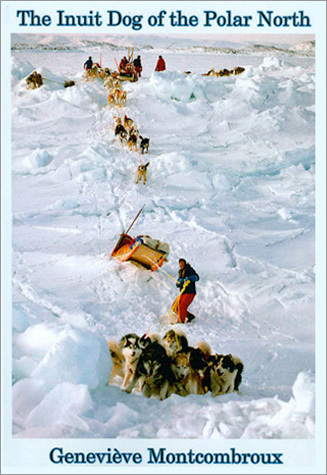 Their means of transport were teams of Inuit Sled Dogs. Ken Pawson gives a compelling narrative often laced with humor. This is not the stuff of dramatic heroism. It is the story of ordinary life in extraordinary surroundings, of men and dogs doing the jobs they were assigned to do. Northern Lights and Dogs is a romance novel full of passion, adventures and sled dogs set in the northern reaches of the Yukon and Alaska. Romantic Times Book Club gave it four stars. Northern Lights and Dogs is an endearing love story that is sure to put a smile on readers' faces. The author's impeccable descriptive detail of the Alaskan wilderness provides a powerful backdrop for a story filled with passion, adventure and personal triumph... Genevieve pens a colorful and exciting portrait of two strong-willed characters who, through their own-self discovery, find not only love but triumph over adversity. A truly entertaining read. Kelly dreams of racing the prestigious Iditarod Trail Race in Alaska. But first, she must hone her skills. She signs on as a handler for a top racer, Tyler Strob. Having to share a wilderness cabin with him poses unforeseen difficulties, particularly when she gives her heart to her surly boss. A losing streak and unresolved personal problems leaves Tyler with a massive chip on his shoulder. Yet under the spell of the vivacious Kelly, he wins the Yukon Quest, the toughest long distance race. When an encounter with a moose sidelines him from the Iditarod, Kelly takes his place. She's sure she can win the race, but can she win his love? The Canadian Inuit Dog: Icon of Canada’s North is an excellent introduction to the Inuit Dog, written in memory of Kim Han’s late daughter, Siu-Ling, who was a beloved musher of Inuit dogs in Iqaluit. The photos are simply beautiful. The interviews with Inuit gives the book an immediacy of the life in the Canadian North. There is a concise history of the Canadian Inuit dog and his importance to the Inuit. Throughout the book, Kim Han subtly reinforces the fact that the Inuit dog is not a pet. Kim Han points out that even an older, retired dog from a team, does not become a traditional pet and a new owner needs to know and understand the nature of the Inuit dog. Kim Han touches on the DNA science which has shown that the Inuit dog is unique and not related to any of the common cultured breeds. It is definitely an aboriginal dog. A short section on polar expeditions is a reminder that men could not have achieved those lofty goal without the Inuit dog. The Canadian Inuit Dog: Icon of the North is a good read. And if your copy has Amundsen staying six weeks at the South Pole, ignore it. It should read that Amundsen reached base camp six weeks after leaving the Pole.